So much information on Ford Model T history published covering both Henry Ford and the Ford Model T that it would be impossible and perhaps a little futile in reproducing all of it again here, so I will endeavour to list some of the main information on the Ford Model T and the man, Henry Ford that literally changed the world. Henry Ford was born on July 30 1863 in Greefield Dearborn Michingan and died April 7th 1947. He held a number of jobs throughout his life and was known to be a prolific inventor and held 161 US patents. It is known that Henry Ford had worked on a number of his own car designs prior to 1903 and that perhaps the most significant was his first attempt, the Quadricycle, built in his coal shed at home and first driven in around June 1896. During this time he was also employed by the Edison Illuminating Company in Detroit, where he remained until August 1899. He left to join the newly formed Detroit Automobile Company that was created to build cars based on Henry's designs, but it was a short venture that eventually folded in late 1900. 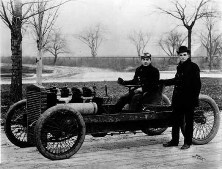 From this time through until 1904, Henry Ford was involved in the building of racers as he determined that a successful racecar was a good way to attract capital investors and he formed and resigned from the Henry Ford Company (and retained his naming rights), this company later reorganised and became the Cadillac company. He then had a business arrangement with successful machinist brothers John and Horace Dodge (who later formed the Dodge Brothers company). 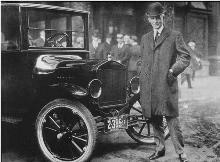 With the backing of 10 investors, Henry continued on and produced a number of Ford cars. 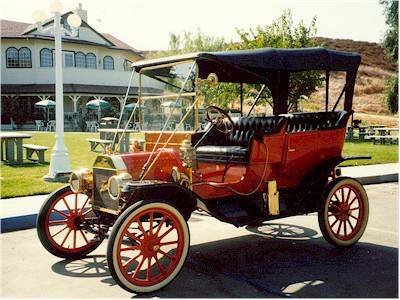 Like many of the cars of the day, they had problems such as overheating but Henry persisted with development work on the Ford Model T.
Officially, the first Ford Model T, #1, was produced on September 27, 1908, although evidence exists that others were made prior to this, presumably, experimental models. 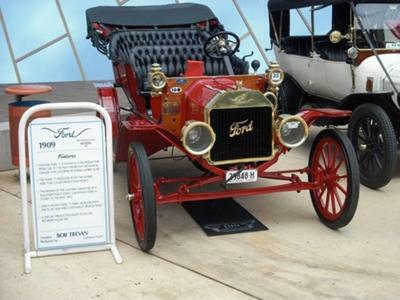 As the Ford Model T was launched and production took off, although at the time limited, compared to the astounding production that was soon to follow, a number of changes to the design of the car occurred early in the peace and although not always obvious, continued throughout it's lifetime. 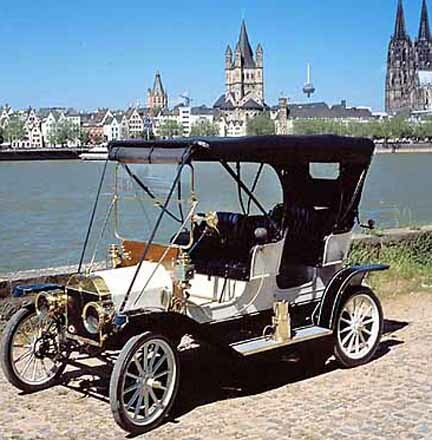 Perhaps significant in the overall design, the three pedal transmission and non-water pump engine, were not actually the norm in the first cars produced, but adopted after somewhere after the first 500-800 vehicles. 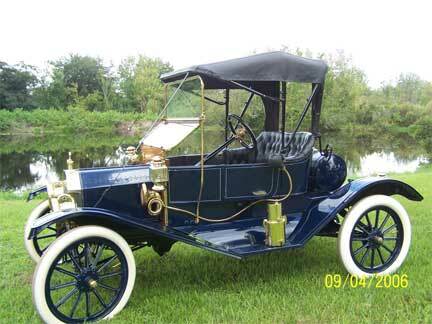 It was in 1909 that the first 2500 Ford Model T cars were produced to a yearly total of 10660 vehicles. These were available in the following styles; Touring, Runabout, Town Car, Laundaulet, Coupe and Tourabout, starting at $825. Cars manufactured after engine #2500 were called production cars due to the many mechanical items changed in the car after this number. The cars manufactured prior to this number were called the "Pre-production cars" and required a separate spare parts section in Ford's parts replacement book. This car was one of the pre-production cars with engine number 2436 and having all the unique features that go with this model. Records show that this car came from Ford's North America, Dearborn assembly line (not Canada). Ford Mo.Co. history indicates that Ford Canada had already been making RH drive T's and designated to be the manufacturing plant for all cars to the RH drive British colonies. Why this car was programmed to be assembled in North America in LH configuration for export to Australia, one will never know. Was Henry going to use this car to try and convert Australia to steer from the left and drive on the right side of the roadway (as Henry had basically done in America) or was it for the Ford Rep that was coming to Australia at that time to drive? It is commonly thought by many that Henry Ford invented the car, and or the assembly line, but neither of these are true. What he did achieve however, was a massive change in the world by producing his cars cheaper and cheaper by the year, by economies of scale. That is, by reducing costs through efficiencies and increasing production, he was able to make a good profit and sell more and more cars until at one point, half of the cars in the world were Model T's. With the application of the production assembly line, Henry Ford managed to reduce the assembly time of his cars in 1913 from 12 hours, 8 minutes to 1 hr, 33 minutes, where all other manufacturers were still painstakingly assembling their cars by hand for wealthy owners. Henry had other ideas and is belived to have said "I will build a motorcar for the great multitude" and by producing a rugged vehicle, simplistic in design and cheap enough for the common man, he did exactly that. It is probably easier to list those things the Ford Model T came without, rather than those that were standard, but the technical specifications were quite advanced for the day. Initally, without a starter, generator or electric lights, the basic Ford Model T also had no oil pump, no water pump and no fuel pump and the transmission would be considered foreign in operation today, but you have to remember that in it's day, there was no "norm" for the basic layout and function of a car and the commonly adopted sliding gear transmission was in it's infancy in design and difficult to master. Many cars of the day had parts of their components exposed to the elements and particularly sensitive and vital componentry such as the Magneto caused constant problems. This was overcome in the Ford Model T Magneto, by enclosing it inside the engine, thus protecting it from water, mud and dust off the unmade roads. By the end of the Model T's production run in 1927, his assembly time had dropped even further until he was producing a vehicle every 24 seconds! But the end was looming rapidly as the design was now considered archaic and the two speed planetary (or epicyclic) transmission limiting as other manufacturers technically passed Ford by. Whether Henry Ford actually ever said the famous statement "You can have any colour your like, so long as it's black" is not really known, but the first vehicles were available in green, red, blue and grey, with the first year of production, black not availbale at all. It is now commonly accepted however, that black was found to be the quickest drying colour and hence it was adopted as the only choice for most of the T's production life.